This 3-star superior hotel is 10 minutes' walk from shopping centre and transport hub Potsdamer Platz and 200 meters from the Wintergarten musical theatre. Free WiFi is available in all rooms. All rooms at the non-smoking Hotel Altberlin am Potsdamer Platz are decorated in late 19th-century style and include a minibar and TV. 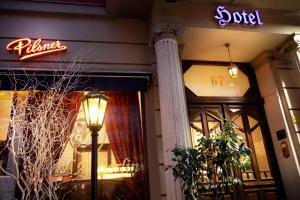 The restaurant serves traditional Berlin meals. In the summer, guests can eat outside in the quiet courtyard with fountain or enjoy the sun terrace. Hotel Altberlin is a 10-minute walk from the Berlin Philharmonic concert hall and the Culture Forum. The Reichstag Parliament building and the Brandenburg Gate are only 2 km from the hotel.